Conflict in the workplace between employees is not always the easiest to handle. As the employer and business owner, you must remain non-biased when facilitating employee conflict resolution. Whether you have a current employee conflict or not, at some point in running your business, you will have to deal with conflict in the workplace. Some employees will be able to settle their own differences, while others will require you to step in and resolve the conflict at hand. Take a quick break from completing tasks on your mile-long to-do list and learn some great tips on how to handle conflict in the workplace. The worst thing you can do while growing a business is letting conflict linger. Large problem or small, it is imperative that you address conflicts immediately before they fester and lead to destruction within your business. Be sure to hear the perspective of both employees and give non-biased responses. If you feel that you are unable to do this, it may be best to bring in a third-party to facilitate the conversation. Tip: To avoid a heated argument between employees, speak to each employee individually and allow them to share their story to you directly. If your business has an employee handbook in place, review it to see if there is an employee conflict resolution policy and follow it during the resolution process. If a conflict is considered a form of harassment or discrimination be sure to handle it carefully, keep documentation and seek legal counsel, if necessary. Every conflict must have a solution. Without one, further conflicts will soon follow. Ultimately, effective conflict resolution in the workplace will result in the employees focusing on their jobs more than the conflict between each other. Remember, your responsibility is to provide and maintain a positive work environment, not to make everyone become best friends. Employees with a conflict that determine their own amicable solution should inform you of the solution. Once this has been done, write down the solution, have both employees sign it, and keep this document on file. For employee conflicts that do not work themselves out, consider giving an employee a different role or moving them to a different team that will not require the conflicting employees to interact with each other closely. TaxBandits understands that small business owners already have enough on your plate as is. Becoming a therapist, professional mediator, or referee should not be another responsibility. 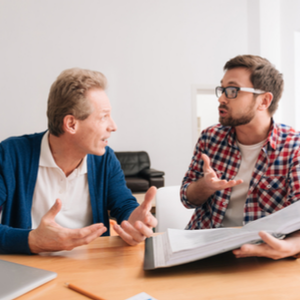 As you use these tips on how to handle conflict in the workplace between employees, don’t forget to meet the upcoming ACA filing deadline on March 4th! ACA Form 1095-B is an annual statement to the IRS by insurance providers, self-insured employers, and employers with fewer than 50 full-time employees. You can easily file ACA Forms for your business with the help of TaxBandits. Click here for more information about ACA filing.